Pump solutions provider Grundfos has officially opened a new facility in Lenexa, Kansas, replacing the company’s facility in Olathe. The building includes a lecture hall with seating capacity for 100 people, a training area for ‘hands-on’ pump education classes and a training video production studio. In a bid to boost the facility’s sustainability, the new office features LED lighting, and a Grundfos Engineered System pump house to maintain water level in an onsite pond and provide supplemental heat to the lobby via geothermal loop. Additionally, the energy efficient HVAC system is powered by Grundfos’ Hydro MPC and MAGNA3, with hot water recirculation provided by ALPHA2. 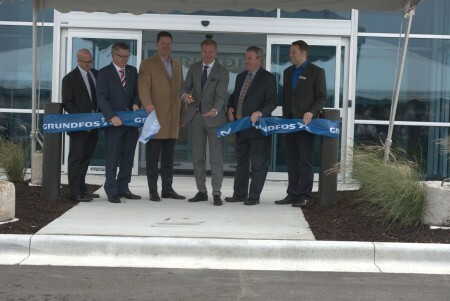 “We are thrilled to be moved into our new home in Lenexa and look forward to continuing our commitment to the Kansas City area,” said Jonathan Hamp-Adams, president of Grundfos USA. The opening was marked by a ribbon cutting ceremony on 10 October, attended by the Mayor of Lenexa, Michael Boehm, Lenexa Ward 2 Councilman Bill Nicks, and representatives from the City of Lenexa and the Lenexa Chamber of Commerce. A leading global pump manufacturer, Grundfos has an annual production of more than 16 million units and more than 18,000 employees worldwide.